Autumn has arrived, and with it my attention turns back to the Sunday Roast. An overloaded plate of steaming gravy and filling Yorkshires never appeals over the summer months but as the weather cools the mind turns to something warming and hearty again. Having had a few pints in the beer garden at the Sir John recently I remembered spotting a sign proclaiming a great Sunday lunch. As well as the charming courtyard the interior looks good, distressed wood is a popular look and is executed well here after a refurb in 2014. They have a pub classics menu, pizzas as well as the Sunday lunch. That said there didn’t seem to be a menu available on my visit, upon asking at the bar the options were simply chicken or beef. There were no starters, which could be a good thing as I’m never sure you need one before the mammoth main event. After a wait that felt long, but might have been artificial due to the pangs of hunger, my roast beef arrived. The most striking thing about the plate was the sizable Yorkshire, the rest a bit of a mishmash of the other items. The meat was sadly overcooked, a characteristic that was shared by my girlfriend’s chicken. At least they are consistent. Vegetables were generally nice and well cooked, potatoes similarly passable but not crispy enough for me. Technically the best element was probably the gravy, I can forgive quite a lot when somewhere gives me a good gravy as it masks other problems. 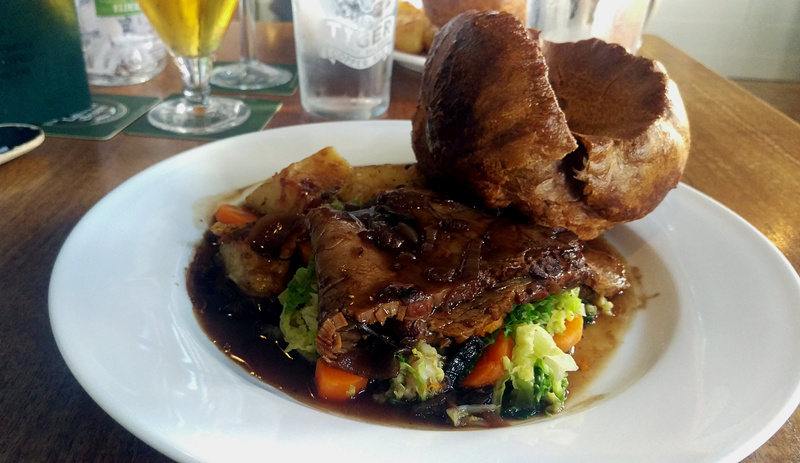 The Yorkshire pudding was a welcoming pillow of batter, crusty dark brown top with a softer bottom nestled in the gravy. The only downside was it was a little over seasoned with pepper. A mixed bag, the beef notably disappointing, which is certainly a shame when presumably that is what you are paying most of your £12.95 for. I can’t say it was bad, just below par when there is a fair amount of competition around. It was a slightly all-round worse version than the very reasonable offering at Fellows (see below) near the Canal. So, go for a beer and enjoy the garden and you might bump into me, but you won’t see me there on a Sunday.